He followed the lessons of Eugenia Yarmonenko at the Central Music School of Moscow from 1962 until 1972. Afterwards he studied at the Moscow State Conservatoire with Professor Jacob Flier from 1972 until 1977. 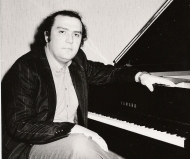 In 1975 he won the First Prize at the International Piano Competition Queen Elisabeth of Belgium in Brussels. He left the Soviet Union in October 1978 and came to live to Belgium. In 1979 he became a professor in the Mons Conservatoire. He was a member of the Jury in the Conservatoires of Brussels, Liege, Luxembourg, Paris. In 1985, from 10 to 18 september, M.Faerman participated in the International Festival of Seoul, where he played a concert with orchestra and a recital.